So a few years ago I began the process of making storage for my tools. 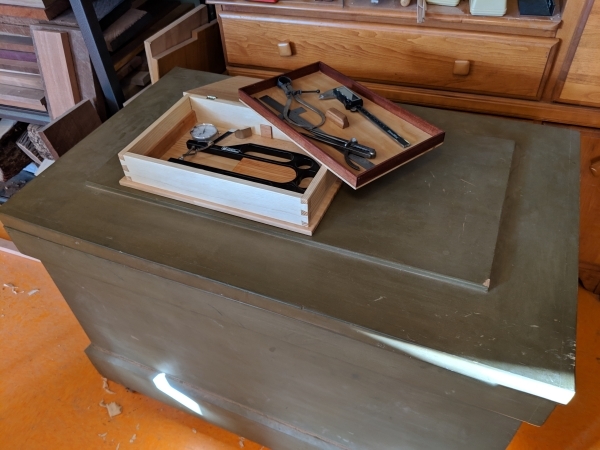 My first step was to build a 18th century style tool chest (courtesy of Chris Schwarz). It is the green colored chest my new box is sitting on in the photo and I highly recommend working from such a chest. Since then I have built boxes and tills to store tools for specific processes in my work. Now it is a matter of pulling out the Fretting box to fret an instrument, the rosette box to cut a rosette, the violin box to access my violin specific tools, and etc. I just recently finished a box for my thickness specific measurement tools. I like putting in lipped trays as they make great tills to bring items to your bench. Wood makes terrific tool storage as it doesn’t ding or scratch your tools, your benches, or your hands. I build my boxes with hand tools using traditional hand cut dovetails and 18th century varnishes. This is great work to maintain your eye hand coordination, makes terrific storage, and by using scrap pieces is very economical. If you think this process is tedious and slow; you should watch Paul Sellers (I am twice as slow as he is and quite content). These boxes will outlast me and bring me great joy. If you budget a few minutes a day to your build schedule, and complete one box a week, you would have made 52 boxes after a year (and probably be great at making handcut dovetails). Now if I could just be as diligent about making blog updates as I am making boxes.